Medicare is a health insurance program offering coverage to individuals who are over the age of 65 and eligible to receive Social Security Retirement or Railroad Retirement benefits. Medicare also provides health insurance coverage to persons under the age of 65 who have received Social Security Disability Insurance benefits for two years or more. An individual who is receiving coverage under Medicare Parts A, B, and D generally will receive health coverage for in-patient hospital care, skilled nursing facility care (but not long-term custodial nursing home stays), home health care, hospice care, physician visits, certain preventative services, lab tests and prescriptions. There are no preexisting condition exclusions for persons entitled to receive Medicare. General information concerning Medicare benefits can be found online at www.medicare.gov, an informational website managed by the U.S. Centers for Medicare & Medicaid Services. When do Social Security Disability Insurance benefits automatically change to Social Security Retirement? Social Security disability benefits automatically change to retirement benefits when the person on SSDI reaches the full retirement age set by the Social Security Administration. Many folks receiving Social Security Disability Insurance (“SSDI”) often think their SSDI benefits automatically convert to Social Security Retirement Benefits when they turn age 65. However, because the Social Security Administration periodically adjusts the full retirement age, anyone born after 1937 does not reach “full retirement age” at age 65. Anyone born after 1960 will not reach full retirement age until age 67, and only then will their SSDI monthly cash benefit convert to Social Security Retirement Benefits. If you were born after 1937, but before 1960, you can determine your full retirement age on the Social Security Administration’s website: https://www.ssa.gov/planners/retire/ageincrease.html. Many government benefits programs that are available to persons with disabilities, like Supplemental Security Income (“SSI”) and Medicaid, limit the amount of monthly income an individual may receive, and the value of certain countable assets the individual can may own if applying for benefits. These federally-mandated limits often prevent someone from being eligible in the first instance, and sometimes may result in individuals losing some or all of their essential public benefits. The asset limits for SSI cash assistance is $2,000, and for many Medicaid programs the limit is $2,500 or less. Therefore, persons with disabilities who depend upon these essential public benefits based on financial need continually must monitor their “countable” assets, as well as their income, to ensure they never exceed the allowable limits. 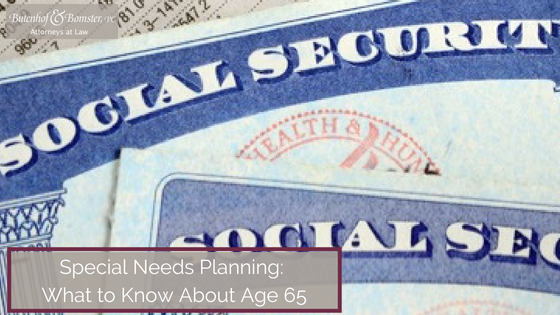 There are some planning options available for individuals to set aside their own assets and remain eligible for SSI and Medicaid. Generally, a person with disabilities cannot transfer assets out of his or her name, especially to an irrevocable trust, without causing a period of disqualification for SSI benefits and some Medicaid programs, unless the transfer either (a) occurred before a time period commonly known as the “look-back period” or (b) the assets were placed into a certain type of irrevocable trust that contains specific provisions and restrictions. These unique trusts commonly are referred to as “self-settled” special needs trusts (“SNTs”), since they hold assets which previously belonged to the trust beneficiary. Assets transferred to a qualifying SNT are exempt from the usual asset transfer penalties for SSI and Medicaid eligibility. However, these irrevocable trusts must be drafted very carefully to satisfy strict federal guidelines. Using a self-settled SNT to hold countable assets or to receive unearned income is a favored planning technique when the goal is to preserve financial eligibility for public benefits programs like SSI and Medicaid. Self-settled SNTs can be created to benefit a person with disabilities who is about to receive an unexpected inheritance, settlement of a personal injury claim, alimony or child support, or who has personal savings and unexpectedly becomes disabled. Again, a self-settled SNT holds funds that previously belonged to the person with disabilities who later becomes the beneficiary of the SNT. Self-settled SNTs differ from “third-party” SNTs, which are trusts that benefit a person with disabilities but hold assets that originally belonged to someone else. A third-party SNT often is used by family members or friends who want to plan for the future care of a loved one by setting aside an inheritance as part of an overall estate plan. Although third party and self-settled SNTs both help to preserve eligibility for public benefits which are based on financial need, like SSI and Medicaid, the two types of SNTs have very different requirements because self-settled SNTs are defined by federal law. For instance, while third-party SNTs have no age restriction whatsoever, the person creating a self-settled SNT under federal law, 42 U.S.C. §1396p(d)(4)(A) (a “(d)(4)(A) SNT”), must be under the age of 65 at the time the SNT is established. The trust must be irrevocable, and must be created either by the person with disabilities, a parent, grandparent, guardian or a court. Also, any assets remaining in a (d)(4)(A) SNT at the beneficiary’s death must be used first to reimburse the state or states for Medicaid benefits paid for the person with disabilities during his or her lifetime. This feature of self-settled SNTs is known as the “Medicaid payback” and only self-settled SNTs have this requirement, third-party SNTs do not. Any funds remaining in a (d)(4)(A) SNT, after paying back the state(s), can be paid to whoever is named as successor beneficiaries. A “pooled” SNT is another type of self-settled SNT that complies with a different sub-section of the same federal law, 42 U.S.C. §1396p(d)(4)(C) (a “(d)(4)(C) SNT” or “Pooled SNT”), and often is used for more modest estates or when an individual needs to spend assets quickly to remain eligible for government benefits. Pooled SNT programs operate in many states, including New Hampshire. Although federal law does not impose an age restriction on who can create and fund a (d)(4)(C) SNT, New Hampshire follows guidance issued by the Center for Medicare and Medicaid Services (CMS) which states that if the person with disabilities is age 65 or older, a penalty for Medicaid eligibility will be imposed for any transfers of assets to a (d)(4)(C) SNT. There is on-going litigation in certain states to clarify whether a transfer to a (d)(4)(C) SNT after age 65 should be a disqualifying transfer that disrupts certain needs-based public benefits. A (d)(4)(C) SNT also must be irrevocable, used for the sole benefit of the trust beneficiary who is a person with disabilities, and created by the individual beneficiary, his or her parent, grandparent, guardian, or a court. Further, like the (d)(4)(A) SNT, a self-settled (d)(4)(C) SNT also must contain a Medicaid payback provision. Under the (d)(4)(C) SNT design, separate sub-accounts belonging to multiple beneficiaries are managed by a non-profit entity. These funds then are “pooled” for management and investment purposes, but each sub-account is used for the sole benefit of the individual account beneficiary – this is why (d)(4)(C) SNTs also are known as Pooled SNTs. Since some financial institutions either do not handle small SNTs or charge fees that may be cost-prohibitive for smaller amounts, Pooled SNTs offer beneficiaries access to skilled investment and trust administration services. Finally, any assets remaining in the Pooled SNT after the beneficiary’s death typically are divided in some proportion between the state(s) for Medicaid recovery and the non-profit entity. If a person with disabilities expects to receive a settlement, an inheritance or any other monies that would increase his or her countable assets to more than $2,000 for SSI, or more than $2,500 for many Medicaid programs, it is important that the individual or family members meet with an attorney who specializes in disability and public benefits planning so that proper planning can be done to protect the person’s continued eligibility for essential programs.